The Porsche Cayenne S E-Hybrid remains part of the recently redesigned Cayenne line up in pre-updated form and is currently the only hybrid model in the range. It enters 2018 with no notable changes. Externally, there is not much to differentiate this hybrid model from the rest of the range visually (excepting the acid green brake calipers) and other than the energy usage display, the interior will be familiar to existing Cayenne owners. While the infotainment system has received a recent update and the cabin quality is still top class, the overall design has been showing its age for a while now and the abundance of physical buttons and a key slot next to the steering column are the most obvious signs. 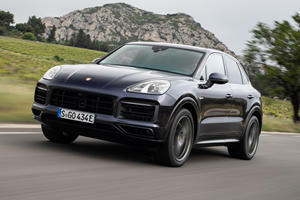 Apart from that though there is a lot to like about the second-generation Cayenne, the front seats are very supportive and there is a feeling of solidity to all the controls and materials. Rear passengers may find it a bit tighter though, especially if there are three of them, and the trunk is slightly smaller than you would expect in this class. A fully foldable rear backrest and standard power liftgate do make it relatively painless to load bulky items though. 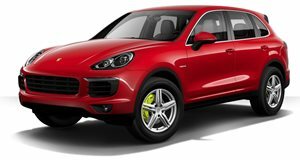 The Cayenne is no lightweight sports car and the added weight of the battery pack and electric motor make this one of the heaviest SUVs in the Porsche line up. So, you may be even more impressed when you first experience the way it responds to driver inputs and how it carves its way up a challenging stretch of road. The strong torque delivery from low down gives the E-Hybrid a sporty feel around town and the standard adaptive suspension management help keep things smooth over rutted road surfaces. 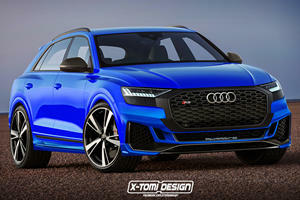 The S E-Hybrid utilizes a 333-horsepower supercharged 3.0-liter V6 gasoline engine and a 95-hp electric motor to produce a combined 416 hp and a strong 435 lb-ft of torque. An 8-speed automatic transmission and all-wheel drive are standard and the 0-60 mph time is completed in a very un-hybrid like 5.4-seconds. 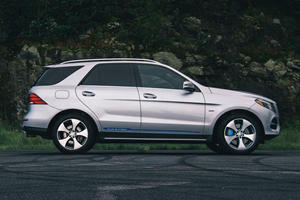 Run the battery power flat though and you will have a noticeable drop in overall acceleration and economy. The claimed gasoline only economy figure of 22mpg is not especially noteworthy, being only slightly better than the standard Cayenne, but the 46 mpge gasoline/electric rating is a lot more promising. Achieving these numbers in the real world will depend on whether your commute can make the most of the 14-mile electric-only range afforded by the 10.8 kWh battery pack. Being gentle with the throttle pedal helps too. The S E-Hybrid shares most of its specification levels with the Cayenne S and this means that you get as standard a 7-inch infotainment display, 10-speaker audio system, navigation, partial leather interior, power tailgate, sunroof, power steering plus, front and rear parking sensors as well as 8-way power front seats with a memory function for the driver. Unique S E-Hybrid items include the 3.0-liter V6 and electric motor instead of the turbocharged 3.6-liter V6 and you also get a 3.6kW onboard charger. You also get an energy management display function and adaptive suspension management as standard. In addition, the Porsche Car Connect feature with E-Mobility allows remote access to various vehicle functions. The Platinum Edition model adds 20-inch RS Spyder design alloys, 8-way powered GTS style front seats with alcantara seat centers, dynamic headlights, auxiliary climate control system and unique exterior trim. Of course, there is always more when it comes to Porsche and there is a vast range of paint and trim customization options available on top of notable available items such as the air suspension, ceramic composite brakes and faster 7.2kW onboard charger. The Premium Package Plus is also worth considering as it adds lane change assist, keyless entry and a panoramic roof amongst other desirable features. The Cayenne S E-Hybrid is one of the best handling and performing hybrid SUVs around, sadly the electric assistance does not translate into much of a fuel saving and the added complexity does push its base price uncomfortably close to the new Cayenne S too. Although, considering that the new Cayenne Hybrid, when it arrives, is quite likely to cost a fair bit more, the E Hybrid may still make sense to some shoppers. Especially if your commute can make the most of the all-electric range. Like the Macan, the next-generation Cayenne could only be sold as an EV. Thanks to a CarBuzz tipster we may have our answer.